Comments: Evergreen conifer native to mountainous regions of California, Nevada, Arizona, New Mexico, Utah and Colorado in The US and to the northern states of Mexico. Tree has short (1"-2") needles one to two per bundle that surround the branch. Seeds from this species were harvested by native Americans for food. The tree is slow growing to 60' and is usually bushy. 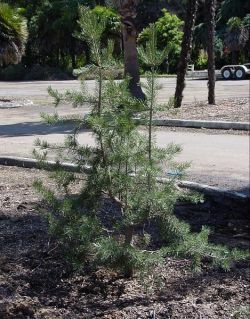 This specimen is 10 to 12 years old and was transplanted to the California Nursery Historical Park from a site where deer browsed its foliage and stunted its growth.